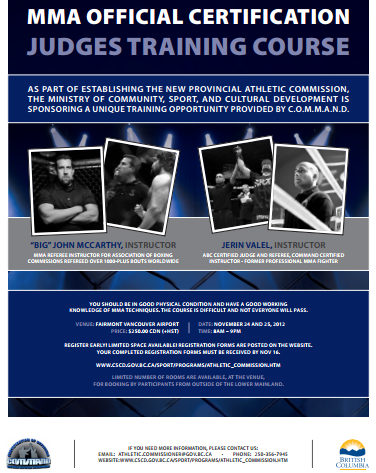 Today the BC Government issued a press release announcing a COMMAND training course being set up in BC with a view towards the eventual certification of MMA judges under the Athletic Commissioner Act. As previously discussed, this legislation will regulate promoters, fighters and officials for professional MMA contests. The regulations under this legislation are still being worked out but today’s press release implies that COMMAND certification may be a necessary pre-requisite for licencing. You can click here for more information on the training course. A copy of the registration form can be found here. Applicants must be 18 years of age or older and applications must be received by November 16, 2012. Amazing course, so good. Best out there!